Biker’s Trauma Training Saves the Day | Hupy and Abraham, S.C.
As riders, we’ve all heard that continuing education is vital to improving our skills and safety on the road. 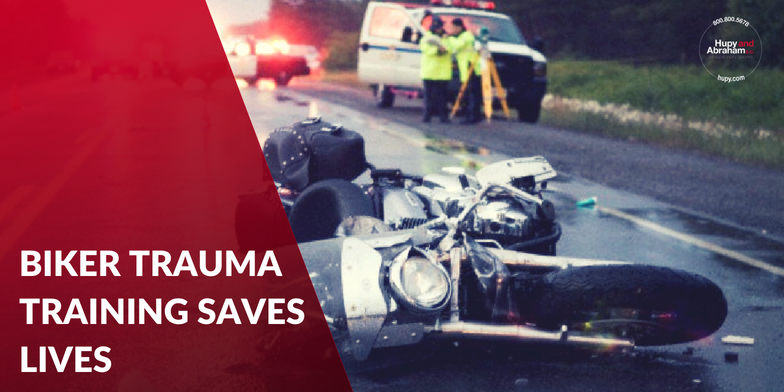 While there are variety of class types available, only one company comes to mind when thinking about motorcycle trauma training – Accident Scene Management. Though going to a class for motorcycling may seem tedious, you never know when those skills might literally mean the difference between life or death. This was the case recently for Quinn Harry, a rider from Baltimore who just three hours after taking Accident Scene Management’s “Crash Course for the Motorcyclist” class found himself at the scene of a motorcycle crash when a driver turned left into the rider in front of him. “I was first on the scene and was saying to myself, ‘This is unbelievable! I just finished the ASM class three hours ago.’ Fortunately, I had purchased the Cruiser First Aid Kit at my class. I grabbed it, jumped out of my truck and ran to the scene,” Harry said. Ideally we as riders will never have to actually use the continuing education courses that we take. Unfortunately though we ride in a world full of distracted drivers, potholes and unexpected problems on the road. Luckily for us companies like Accident Scene Management offer fantastic courses to help us not only better ourselves, but also be prepared to take care of our fellow brothers and sisters on two wheels! For over 50 years, the law firm of Hupy and Abraham has been a proud supporter of biker causes and companies like Accident Scene Management, the “largest motorcycle trauma training center in the world.” Hupy and Abraham understands the importance of promoting rider education AND awareness in the mission to reduce motorcycle fatalities and accidents. To help support the “Watch for Motorcycles” awareness message, you can order your free bumper sticker by clicking here! And for more information on continuing education courses and resources for motorcyclists in Wisconsin, Illinois and Iowa, check out the Hupy and Abraham “Current News for Riders” section by clicking here! If you or a loved one has been injured in a motorcycle crash, please feel free to contact us online or call us directly at 800.800.5678 to schedule your free consultation.